Cyberpunk 2077 could shake up its namesake genre in the same way that The Witcher shook up medieval fantasy. The cyberpunk genre has been through a bit of a renaissance lately. With the added popularity from being back in the limelight, some of the classic cyberpunk tropes are beginning to slip into the realm of the clichÃ© - there's only so many times you can play the Corrupt Megacorporations card before it all starts getting old. 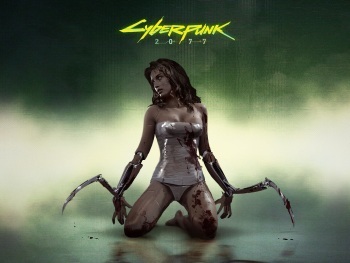 This presents an ironic challenge for CD Projekt and their upcoming title Cyberpunk 2077 - a setting that once paved the way for its titular genre is now a predictable collection of familiar themes. Yet Adam Badowski, studio head at CD Projekt, isn't worried. It isn't the first time he's revitalized a tired genre. "We're the owners of our IP," Badowski said in a recent interview, "so we're free to do almost anything with Cyberpunk and The Witcher. We're creatively independent. It's a good thing to have." It's this freedom that allows the studio to steer seemingly familiar settings in interesting new directions. So far, CD Projekt has been successful in exploring the moral gray areas of high fantasy, and plans to continue that approach with Cyberpunk. "We always wanted to avoid good and evil scenarios," Badowski explained. "We have a lot of work ahead of us in that regard because the established plots for Cyberpunk - the wars between corporations, fighting against advanced AI, wars of energy sources, have already all been covered quite thoroughly ... In our opinion, though, nobody has shown Cyberpunk in the way that many people imagined it." If CD Projekt's vision involves turning a few classic tropes on their heads, then as far as they're concerned, that's all the better. "We want to refresh this universe," Badowski said, "which means we have to have a new creative approach to things. We believe The Witcher taught us that we can handle it." The trademark adult-fantasy approach utilized in The Witcher could be less effective in this new title, since moral ambiguity has always been a staple of Cyberpunk. Still, the folks at CD Projekt have proven to be masters of subverting expectations, so they may find a way to breathe new life into the IP yet. And even if not, the world still has room for another archetypical romp through traditional cyberpunk.